The police officer that was charged with protecting Stoneman Douglas did not enter the building even after he heard shots being fired. This was an inexcusable dereliction of duty and act of cowardice. But, is it surprising? Is it surprising that, being faced with the prospect of a firefight against a perpetrator that was more favorably armed (with a high velocity rifle and faster rate of fire) that this officer chose not to face certain death? Would you? Would I? I ask this question not to absolve this officer of his wrong, but to examine the feasibility of the solution that our President proposes; arming teachers. How easy is it for someone in the fog of a firefight to calmly distinguish perpetrators from students, harness their courage, and charge someone armed with an assault rifle? Can a teacher turn himself into John McClane from Diehard with the help of a .22 and weekend training? Soldiers and police officers dedicate themselves and their time to steady their resolve in such situations, and even then some of them revert back to risk aversion when danger looms. Can we expect a teacher, who dedicates their time to the art of teaching, and can afford only a few hours for gun training, to behave the way that a trained soldier can in a firefight? I give our soldiers and officers more credit than that. The fortitude that they forge through discipline and training cannot be replicated in a teacher’s spare time spent in weekend courses. Even if we can turn teachers into John McClane, would simply arming them be effective? Their primary duties would still be to teach. They are not sentries. They will not stand guard at the doors to prevent perpetrators from entering. The perpetrators would still enter and our “armed teachers” would have a delay in their reaction before the sounds of gunfire finally prompted them to stop class, unlock the safe to their arms, and turn into superheroes. Even if the teacher was fortuitously located near the perpetrator, that process would take 15-20 seconds. How many children can he kill in that time? We designed assault rifles to kill expediently. We were very good in that task. What would these teachers be armed with? In order to match the arsenal that most mass shooters bring to a killing, the teachers would need assault rifles. Would they have the rifles with them at all times? It seems risky to have five assault rifles roaming a school while teachers attempt to divide their attention between teaching and securing their arms from curious students. Would they be locked away? If so, there is a risk that students would try to get to them while teachers were busy…teaching. It would also take a teacher some time to get to the lockbox during an attack, adding thirty seconds to the reaction time, maybe more? That’s another ten kids. It is obvious that securing schools would require trained guards, stationed near entries, that are tasked only with the job of securing the school. The reason the President favors armed teachers over guards is not because it is an effective plan, it is because guards cost money. We want to solve the problem of gun violence without having to make sacrifices, but a sacrifice will have to be made. We can stand by and just let the violence continue, we can enact practical gun and munitions control legislation, or we can pay the high cost of implementing effective security at our schools, but we must do one of the three. Implementing a cheap, ineffective security plan is tantamount to doing nothing and may actually increase school deaths due to the proliferation of guns it would expose schools to. 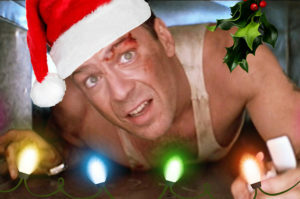 Die Hard is a very entertaining movie, but it is just a movie. We need real world solutions, and that requires tough decisions and sacrifices.